There are numerous reasons why artists want to have and be a part of Art Shows. One may be a very simple desire to recoup some of the cost that goes into the making of their creations. Another might be to go beyond that and actually make a profit. Some artists may wish to develop a following, extend their list of collectors. Others desire to receive favorable reviews of their technical expertise. But I have a feeling that most artists and creative folks have a desire and intent underlying all these things. Art Shows, museums, exhibits and galleries are meant to be reminders to us all that no matter how bleak life may seem, beauty still exists! If you find yourself fearful in the aftermath of the Paris tragedy, weighed down with personal concerns, heavy hearted with unwelcome news…go find an art showing somewhere. Spend some time taking in how that artist sees his/her world. Let that art speak to you and remind you of what is true, good, and wise. You just might leave with a lighter step, a brighter countenance, and hope for what lies ahead. 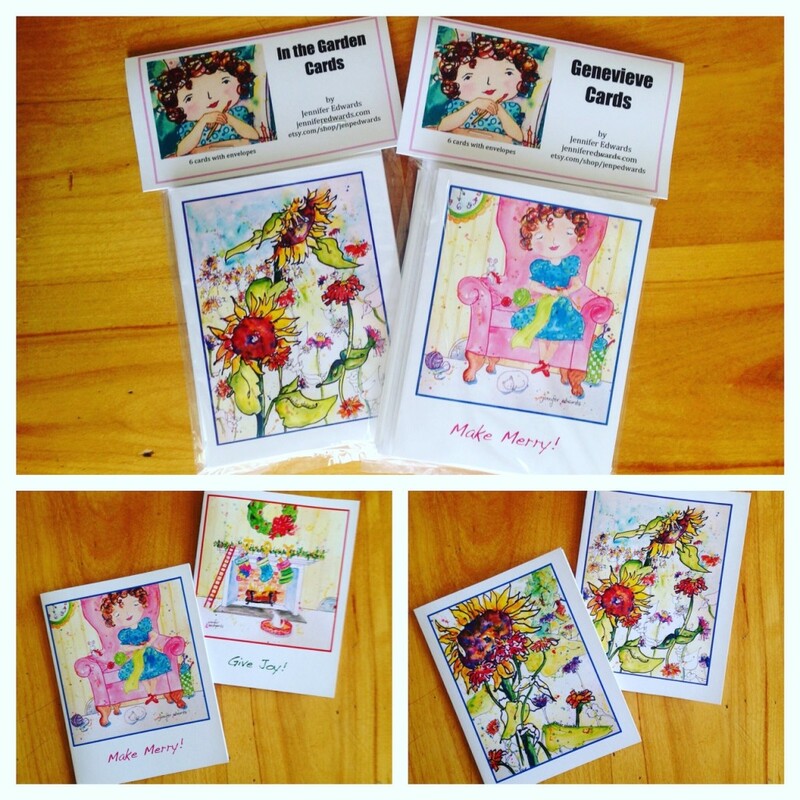 *21 New Paintings *2 Embroidered Line Drawings *Freeform Crochet Landscape *New Card Sets *Book Signing *and more! 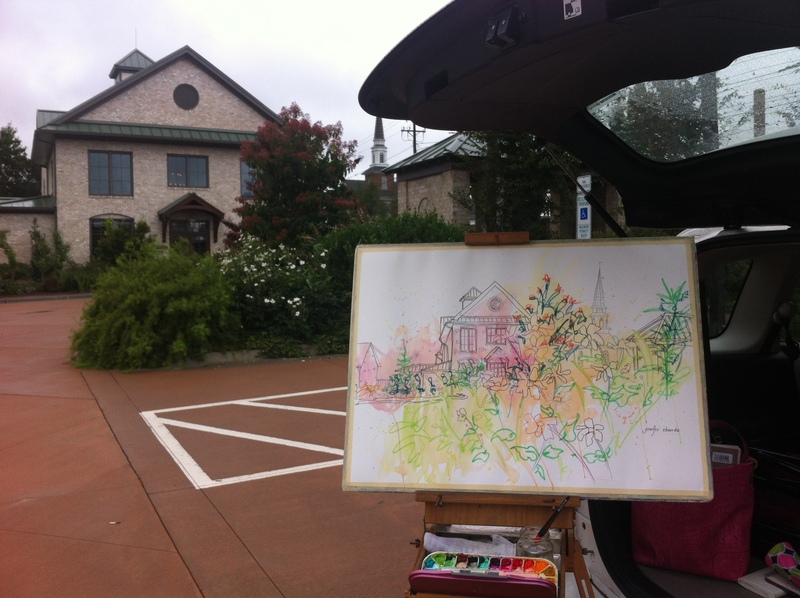 I’ve begun toting a big Aquabee sketchbook to the Friday morning drawing session at Eclection here in our town. This sketchbook measures a whopping 14″ x 17″, and the above is the first in this book. I’ve loved this sketchbook in its 9″x9″ format so I knew I’d love the big size. Election is the coolest place to draw!! I love it so much as they have such a variety of things to choose from for subject matter and I absolutely adore hanging out with the artists who join me. 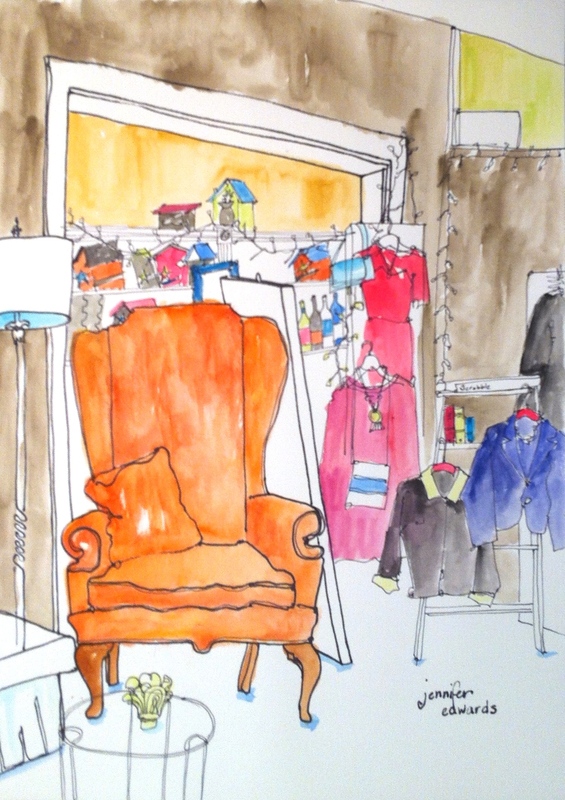 Above is a recent drawing of “the wall” at Eclection, which is ever-changing with the holidays and seasons. I’ve drawn it here before. 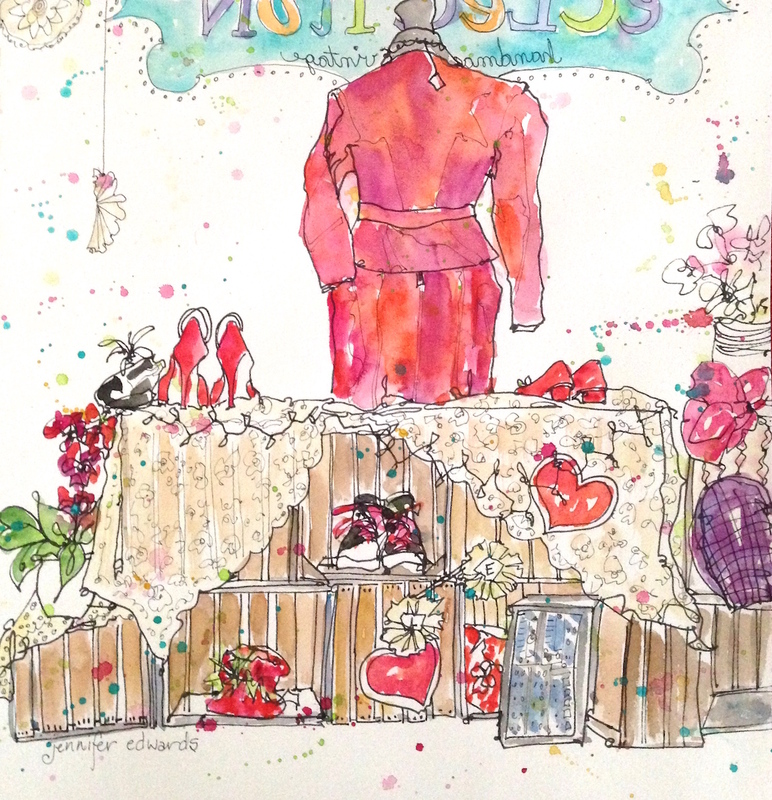 And this is a recent drawing of a Valentine’s display under the front window. SO MUCH FUN!!! Chris and Amanda (the owner of Eclection and her amazing assistant) have asked us to offer some cards of our drawings of Eclection to sell in the shop. AND…sometime in April they are going to host a gallery opening for us! We are so excited about this! If you live anywhere near Kernersville, NC you should drop by and see all of our card selections! And while you’re at it, you just have to browse all the artisan’s booths…such creative and fun stuff, perfect for your home or for gifts. 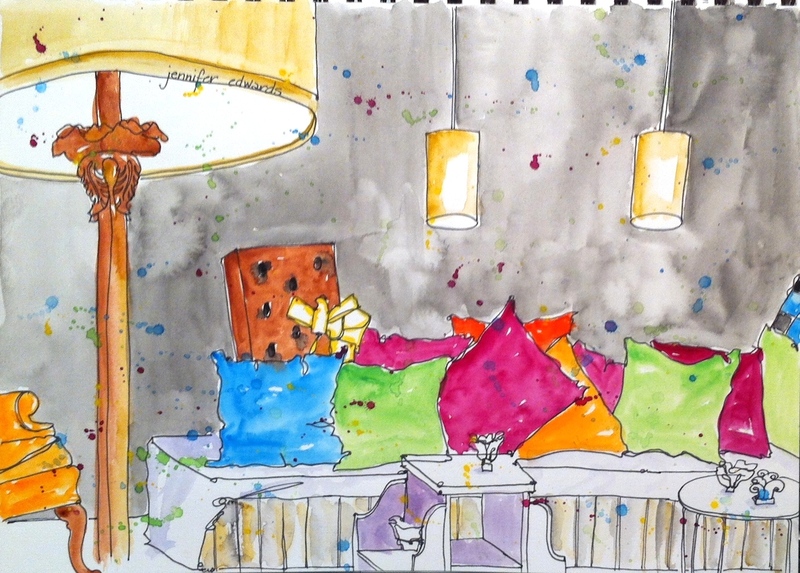 Then come by on Friday mornings from 10-noon to draw with us! You’re guaranteed a good time and plenty of great stuff to draw! One of the artists whose work I admire on the One Drawing A Day blog, Michelle Bedigian, posed a challenge over a week ago. 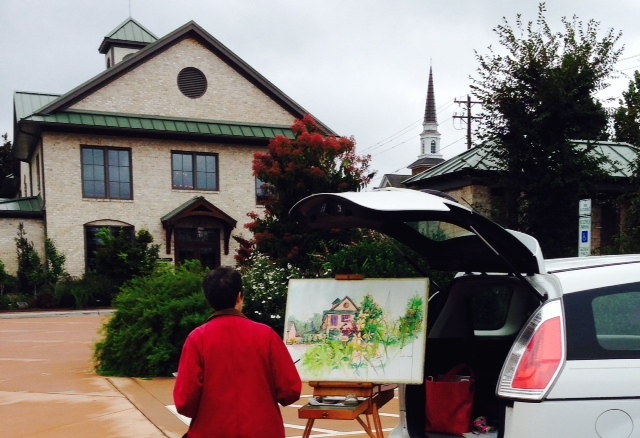 She recounted that one of her former teachers had challenged her to “Go Big” when she went out to sketch on site. This was to shake things up a bit and to make her approach a drawing differently. The “big” size she was challenged to do was 36″ x 42″…oi! I took this challenge immediately! However, not even owning a board or paper coming anywhere near that size, I decided to use the largest piece of paper I had which was 22″ x 30″. 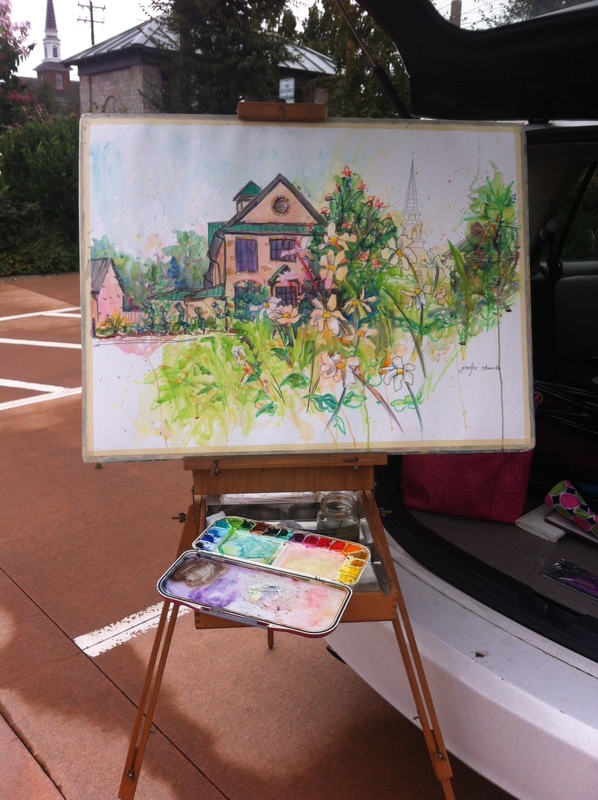 All week long I looked forward to taking the hot press w/c paper on a board with my French easel and all kinds of drawing media and watercolors, to our Ciener Botanical Gardens here in Kernersville, NC. I typically draw and paint there with no bigger than a 9″ x 12″ sketchbook, so this was going to be fun! I have certainly done larger paintings and drawings on location before, but this time I wanted to approach it in a similar manner to how I work in my sketchbook and see what would happen. In other words, I wanted to “think drawing”, rather than “proper painting”. This may not mean anything to you, but in my mind, there’s a big difference. Friday morning dawned with gray skies and spitting rain. We had been having this weather all week and I was just sure the clouds would part for Friday’s adventure. Humph. Not to be daunted, I hauled my stuff there anyway, determined to find some way to “Go Big”, even in the misting rain. Right as I hopped out of my car, I saw it. Just the view I wanted to draw! Flowers in the foreground, main building behind with the Methodist church in the far background. Yes! And as I got out my stuff, I realized the back hatch of our vehicle would provide some shelter from the spitting rain. Perfect. I got really caught up in the moment, only stepping back a couple of times to take a look and dive back in. After two hours, I decided I had hit the “niggling” stage. This is where I begin adding little bits of this and that which aren’t really helping anything at all. Even though I wish I had stopped long before I was near niggling it to death (I almost like the “drawing only” version the best! ), I still liked it immensely if only for the fact that I did it! I drew larger and more expansively and oh boy was it fun! I can’t wait to do this again! My little brain is hopping with ideas and different approaches and mixes of media! Definitely a challenge worth taking many times over! Perhaps you’ll try it too! I highly recommend it! I’m including some close-ups of specific areas of the drawing so you can see it better. It really was a gray day so I apologize if the photos are a bit dim as well. C’est la vie! Faber-Castell watercolor pencils, Feber-Castell PITT artist pens of various tones of black and gray, Prismacolor Premier Fine-Line Marker 08, Loew-Cornell oil pastels, Loew-Cornell 7020 Ultra Round watercolor brush size 14, American Journey Watercolor paints with a few DaVinci Gouache colors. 1. to spend too much time and effort on inconsequential details; trifle. 2. to criticize in a peevish way; carp. ***Should you be up for an excellent read about an artist’s life, read J.R.R. Tolkein’s Leaf by Niggle. A few days ago, I was out walking in the morning. Mr. Whicker has bought the land on the back side of our neighborhood and has cleared out the brush, put up a wire fence, to make a lovely pasture (one of several he has on his land) for his cows. I’ve been visiting this back field all summer (a painting of the view here) to see if the cows have been allowed out to graze. This was the first day I’d ever seen them there. The area surrounding the fence is overgrown with kudzu. Yuck! So I waded into the knee-high kudzu covered brush to get right up by the fence and take a few pics of the cows out in the field. All the while, I was hearing a munching, crunching sound over to the left not far from where I was standing. I did not see anything, so I didn’t pay much attention as I took pictures. Then, I saw him. One ear, peeking around as he munched on the leaves and kudzu of a small tree only about 10 feet from where I was standing. I began clicking away, capturing the cow as he ate him morning meal. He did not see me for a while…and then…as it dawned on him that someone was standing there disturbing his breakfast reverie, his eye got bigger and he bolted! The sound of his huge girth pelting the ground as he ran away down the hill, is something I’ll not forget. He let out a howl and alerted another cow, apparently also enjoying a kudzu covered tree right next to him, whom I had not seen. The two of them dashed down the hill to join the others, all of them looking back at me, as if to see whether I would join the chase. This is just one of many things I LOVE about living right next to a farm. Oh my…what stories I have to tell!! And I love to try telling them in my drawings and paintings. I created a piece from one snap of my camera where he is still munching, oblivious to me. I am absolutely tee-totally having fun with watercolor and collage! Remember this one? Oh my…I feel a series coming on! But what excites me even more is that I’m going back to Skool!!! Yes, folks, I’ve signed up to take a class, actually SIX of them, starting October 3rd!! I CAN’T WAIT! 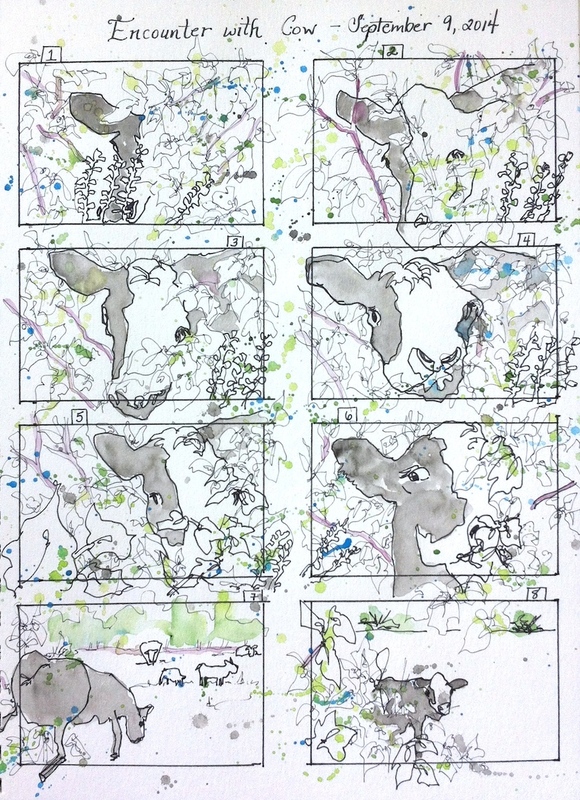 The same day this encounter with the cow happened, I saw THIS VIDEO on Danny Gregory’s blog about the upcoming semester of Sketchbook Skool…I drooled. Seriously. Not only do I get to be taught by a couple of artists whom I have greatly esteemed for several years now, Veronica Lawlor and Melanie Reim, but I also get to have a day of sketching in Paris with a French artist, and of course, a class from Danny himself. All 6 of the teachers in this series are teaching about STORYTELLING, and oh boy am I excited about this!! The price for these classes seemed too good to pass up! 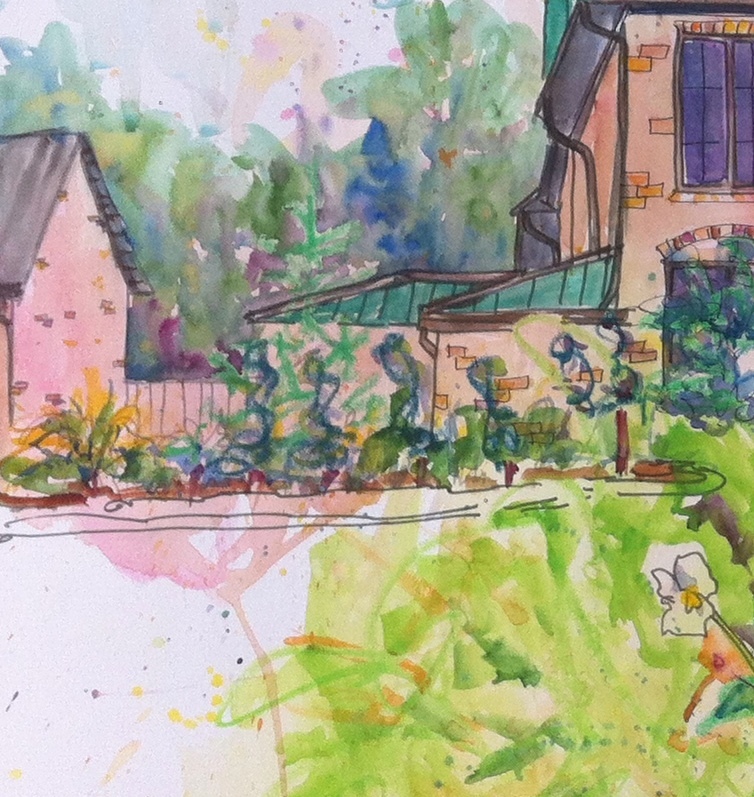 I’ve been out drawing various places on Friday mornings and relishing every minute! 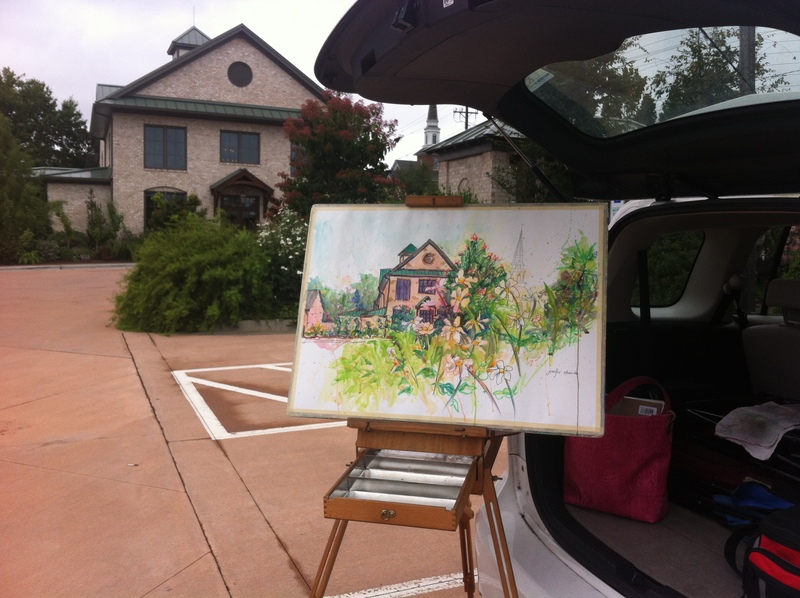 My friend Debbie and I parked our drawing chairs in the Gardens, finding all kinds of autumn beauty to draw and paint. 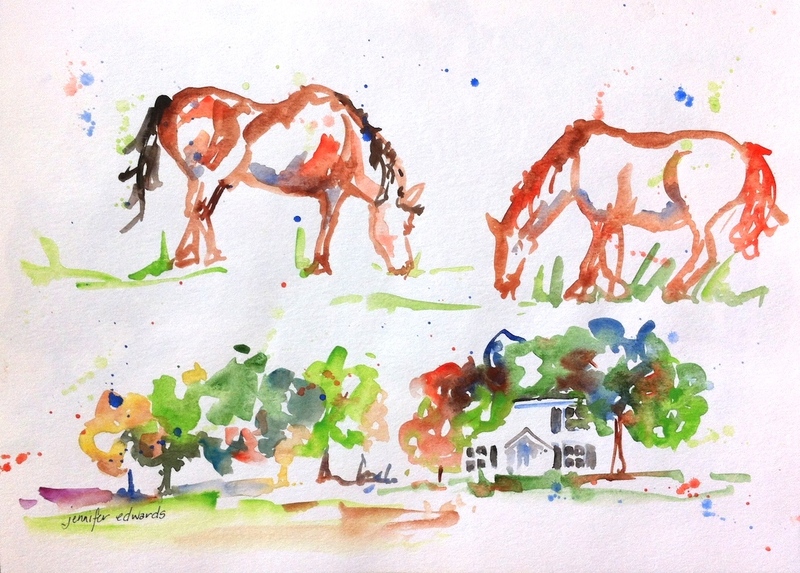 A few weeks ago, we ventured just across the street from where I live, to draw the horses at Smith Hollow Farm. My line drawings of the horses kept looking a lot like donkeys (ahem), due to not giving them the correctly proportioned long legs! I’m not sure my watercolor sketch got it right either, but they seem more like horses to me. Near the end of our time at the farm, I turned my chair to look down the road. I dashed off this simple watercolor and didn’t think very highly of it at the time. Debbie liked it a lot and encouraged me to look at it again in a week or so…I might like it better, she said. This happens to both of us fairly regularly…not liking what we’ve drawn, but finding that it seems to improve a bit after getting away from it for a while. I’m not exactly sure why that is. 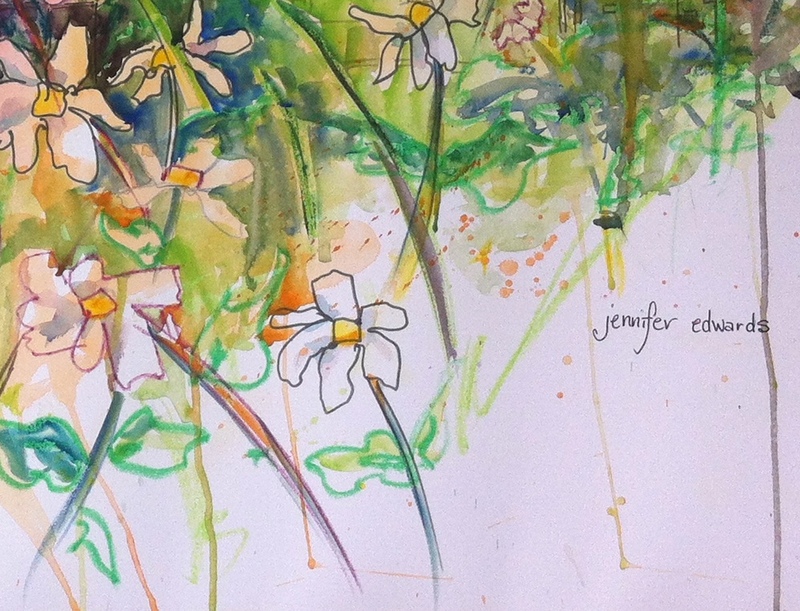 Something to do with being too close to it at the time of making the drawing, and needing a bit of breathing space. I’m also busy revamping my Etsy Shop! I’ve decided to create a second Etsy shop purely for the knit & crochet patterns, so that my current shop, now named Drawn2Life will only have original works of art, cards & prints, and signed copies of my books. It isn’t quite there yet, if you happen to visit. Soon….very soon! I hope you are able to drawcument something about your life today. 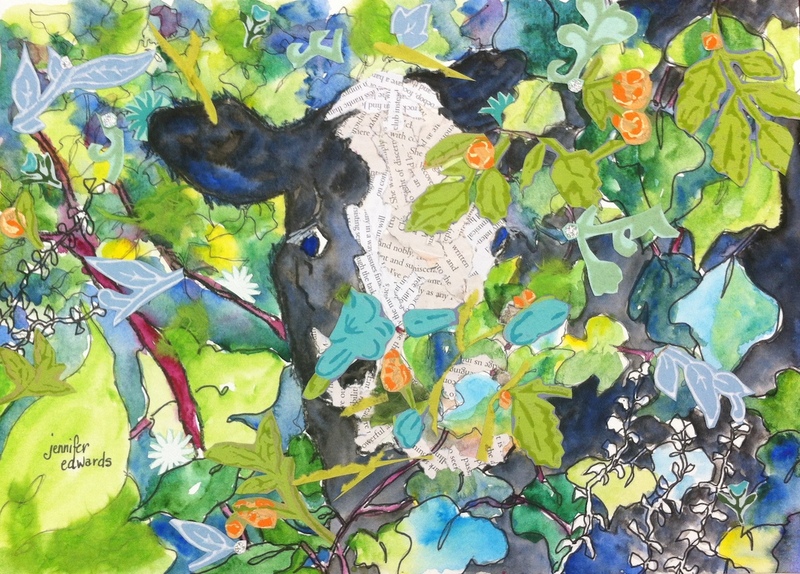 I have an encounter with a cow that I plan to paint today…can’t wait to share with you! This one just about got away from me! Some of you may feel that it actually DID get away from me. I dunno. It does seem to be teetering on the edge of chaos. One of the things I love about watercolor is how it has a mind of its own and begs to be allowed to frolic however it will. I like the look of a painting that at first seems chaotic and you’re not sure exactly what you’re looking at. But once your eyes adjust and land on a few distinct things, the image begins to make sense. I’m not saying this one totally fits that bill, but it’s close. I like the explosion of it…the unhindered color works held together only by the little picket fence…just like in real life. Daily I walk by this neighbor’s small garden spot that surrounds their mailbox. 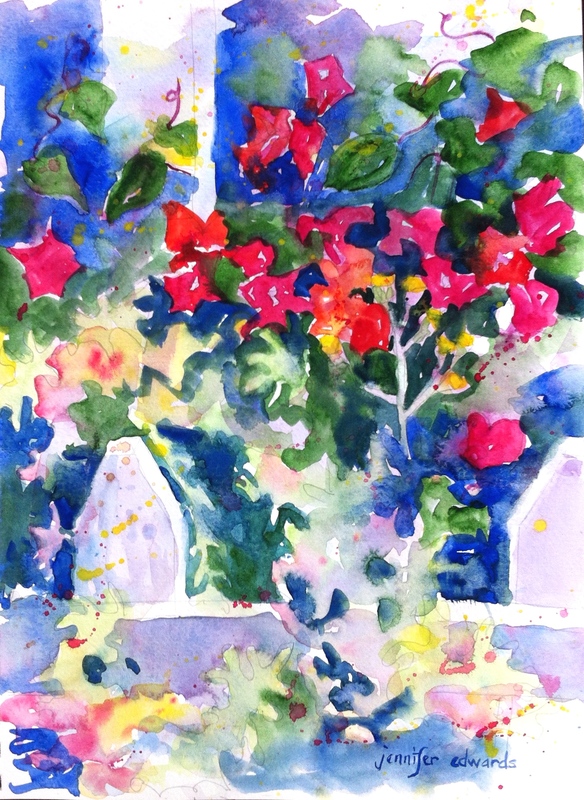 I’m pretty sure that’s bougainvillea there blooming in red! Gorgeous reddish pink flowers that look like paper! It is set off by this silvery looking plant with yellow spike flowers here and there. I continue to marvel at how I really do not expect to see such beauty in my own neighborhood. Not until I look for it, zoom in on small areas, photograph it, and paint it. Kind of like being a hunter. I have to peel back the layers to reveal what’s actually there. Beauty in chaos. Yep. I like that. 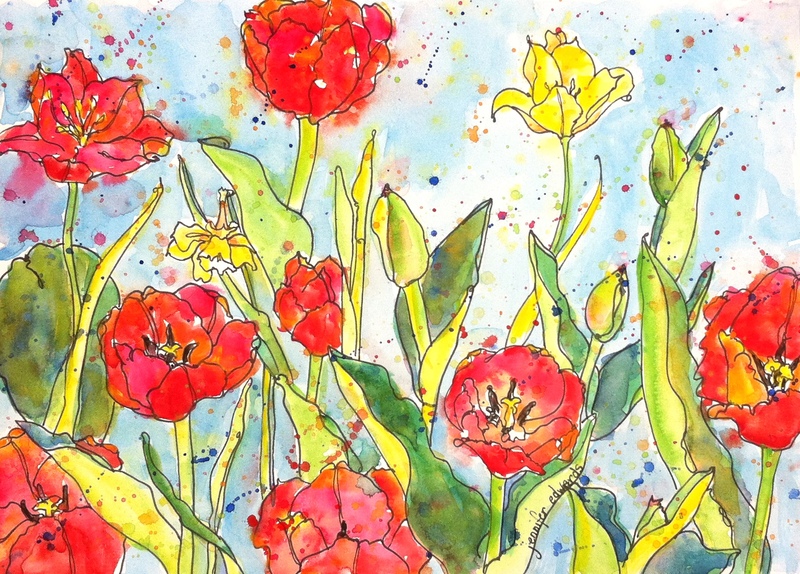 The paint is barely dry…and these two fresh off-the-drawing-table tulip paintings are now at Southwinds Gallery here in Kernersville! 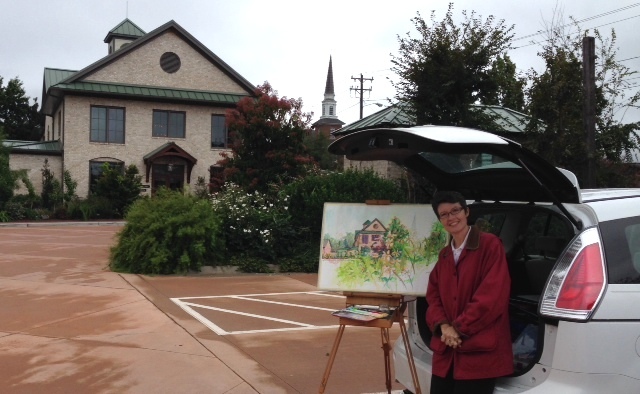 Be sure to call Angie at Southwinds (993-0818) or drop by the Gallery to see them! Each of them measures 9″x12″. The perfect size for gift giving. 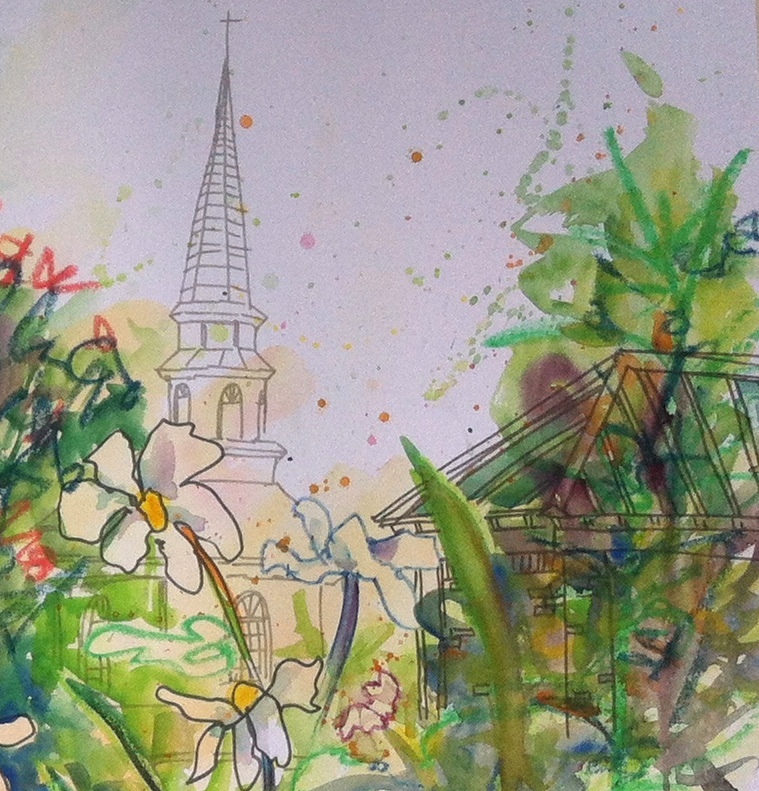 Perhaps you have someone you’d like to give a painting to for Easter! Or a hint to your spouse for an Easter gift for you might be just the thing! These are only a few of the tulips now blooming at our Ciener Botanical Gardens which have just begun to bloom and will be blooming over the next three weeks. When I was there to draw last week, I got to meet the new Executive Director, Mr. John Whisnett (sp? 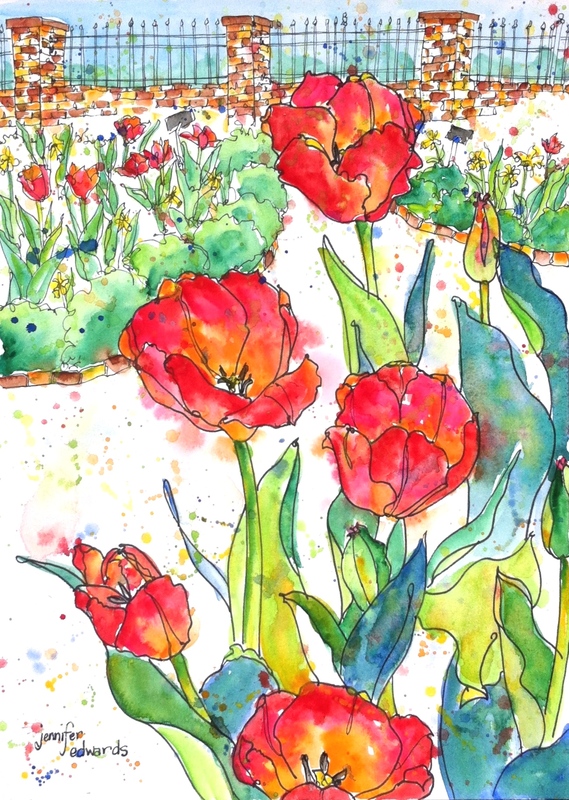 ), at the Gardens and he told us how they plant early blooming tulips as well as late blooming tulips so that there’s an abundance for several weeks! 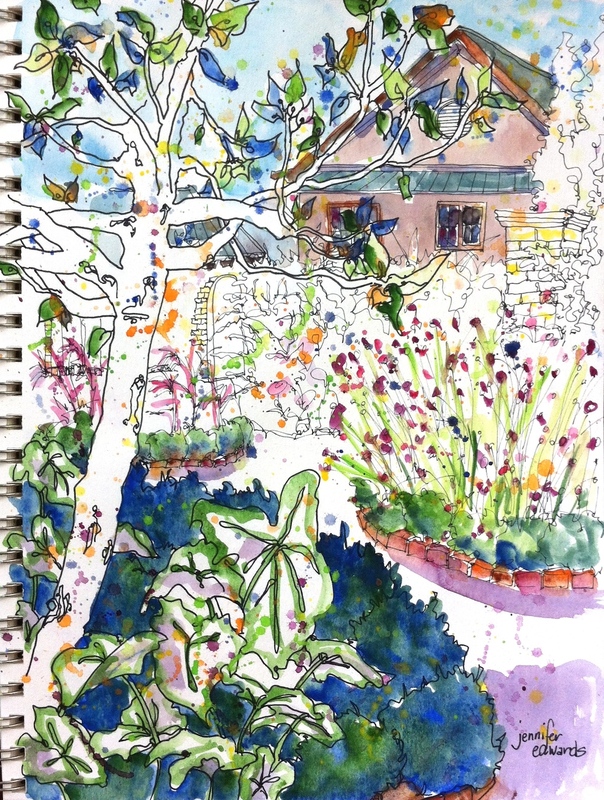 Be sure to visit the gardens for a lovely walk and time to sit and draw, or paint, or knit, or just think. I’m reading a book titled Live What You Love by Bob and Melinda Blanchard. It sat on a friend’s coffee table, I picked it up with interest and have enjoyed reading it thus far. I like topics like this…dreams. People who pursue them. Stories of how they achieve them. What I like about this book, is the heavy dose of Reality peppered throughout their “notes from an unusual life” (subtitle). I keep thinking, however, of an alternate title. Not for this book. For a different book. Maybe one I’m supposed to write one day. Instead of Live What You Love…the phrase, Love What You Live keeps popping up. I don’t think of these as polar opposites. But somewhere in there, between the stuff of dreams and reality lies a subtle shift in focus that has helped me for many years. And still helps me today. I would say, fairly confidently, that I’m a dreamer. My mind has always preoccupied itself with dreams and daydreams, the small ones and tall ones. As a little girl, I dreamed via my dolls and their house, much of which was handmade. I dreamed of driving a VW bug one day and so made them a cardboard version. In college and early marriage years I drove a 1968ish red VW bug. Today, I still want to drive a VW bug, lime green or robin’s egg blue would be fun. Red again, would also be lovely. This is not a materialistic dream. (I recognize the oh-so-typicalness of the late 40’s woman wanting to drive a bug! Oi!) There’s something bigger caught up in that Lime Green Bug. The girl who drives it is artsy and fun, if a bit eccentric. She goes on picnics and drives it around the French countryside. She pulls her art materials out of it to draw in a field. She knits up beautiful things to wear and to give away. She writes stories and illustrates them. She has tea in the afternoon with whomever will join her. This same girl drives her VW bug up to a small cottage where she lives with her family and has a few chickens and goats. Maybe she even has a sheep or 2 or 3, whose wool she spins and dyes to later knit up into fun stuff. 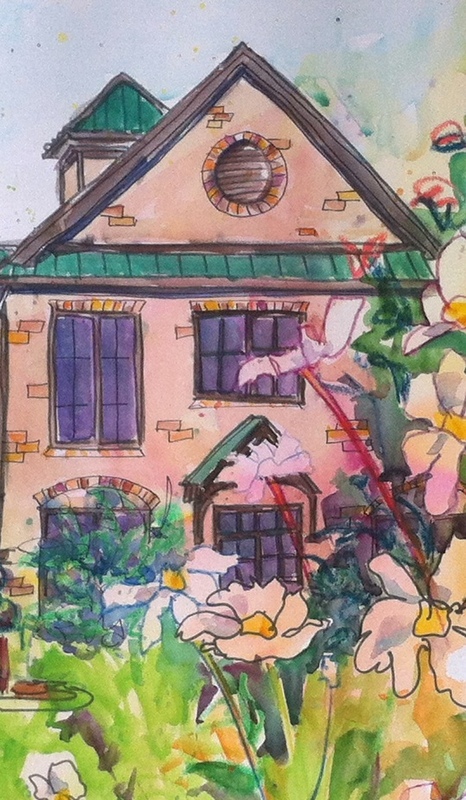 Her cottage is painted cheery colors and it’s always just a smidge disheveled looking. There are old things here and there, furniture with stories, and handcrafted items everywhere. 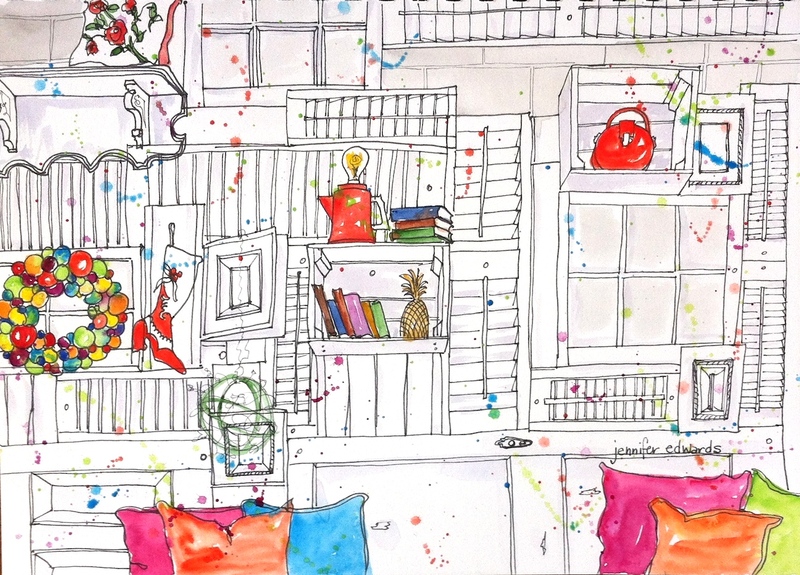 Her art, as well as her kid’s art, is on the walls. Her VW bug is perfect for getting around the small, quaint town in which she lives. 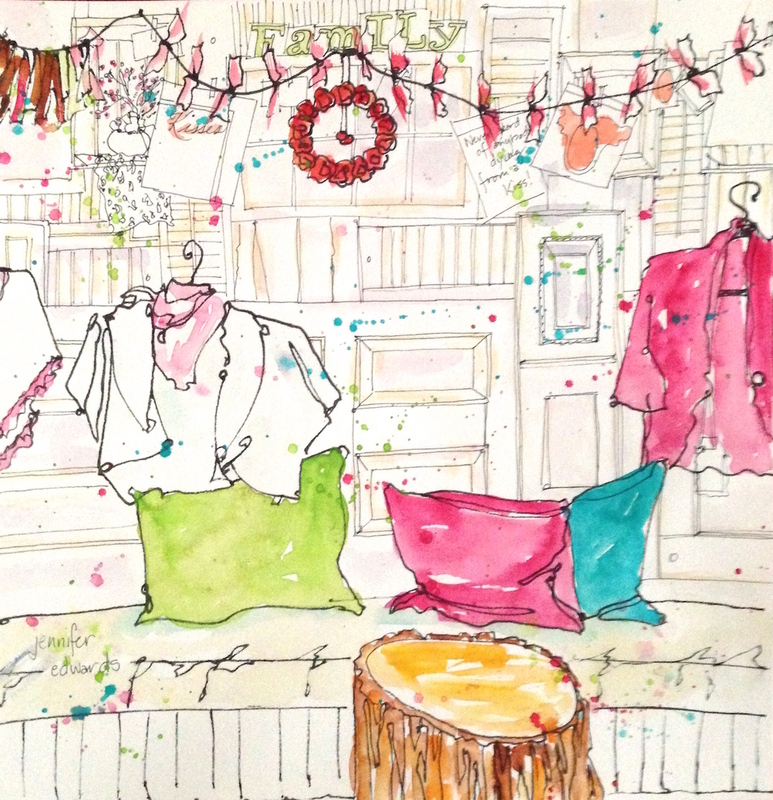 Everywhere she looks, she sees thing to draw and paint, colors to knit or crochet. And when she can’t see something beautiful, she draws it anyway, and in-so-doing she finds the beauty she wasn’t able to see before. It was all there in that dollhouse I spent hours and hours making years ago. Dolls I had made, with clothes for them to wear, knitted blankets on their beds, pillows I had sewn. I didn’t actually set out to make my life that of the doll house. It’s a bit uncanny how my life now resembles this childhood dreamworld I and my friend Linda created. So much of it is my life now, with heavy doses of reality thrown in here and there. There are some dreams still “out there”. I still want a VW bug. I’m still waiting to travel to France. I do not have any chickens or goats or sheep. Our HOA would kick us out of our suburban neighborhood. There have been times, however, between the doll house and now, when I have pined for a life other than the one I was living. 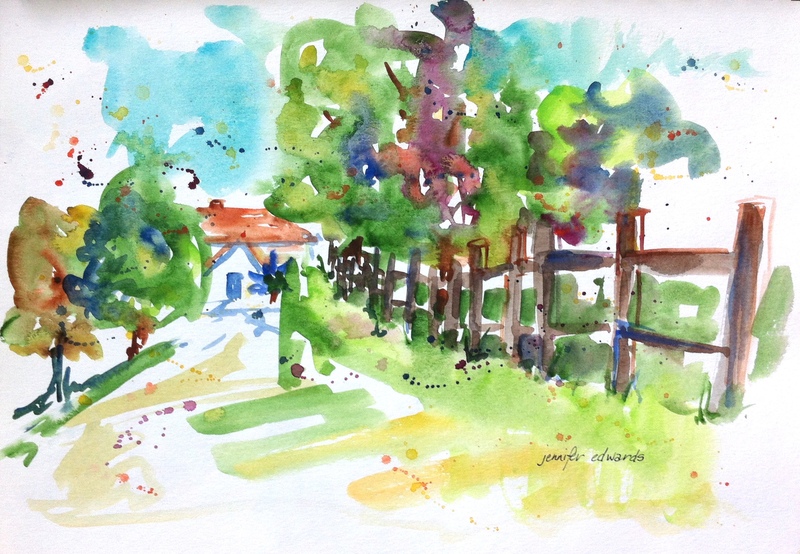 When I was 32 and began to draw and paint, I started to see that the life I was living was the one I loved. 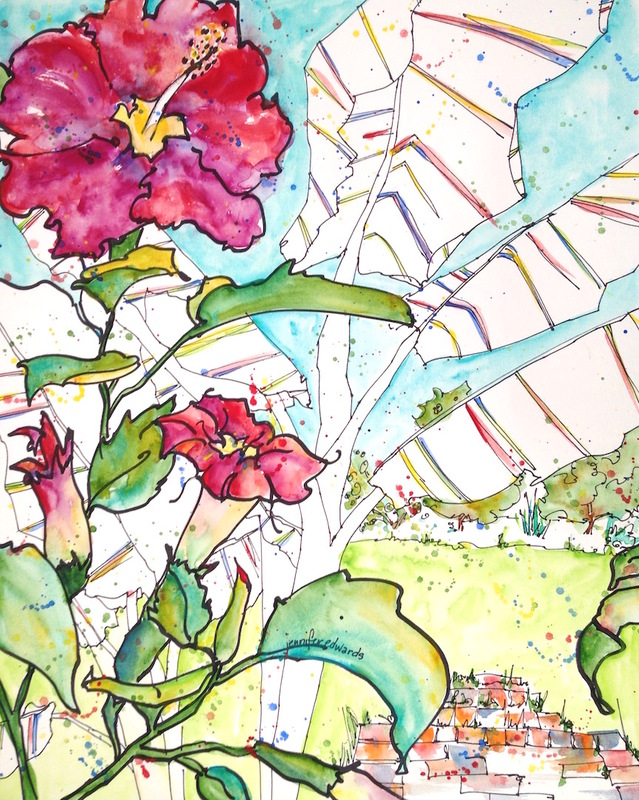 Through creating drawings and paintings of the flowers in my yard, of my children growing up– playing on playgrounds, licking a lollipop– I could see the sparkling beauty of the life I was living. It was also around this time that I began to knit in earnest: a vest for Catherine, a hat for William, mittens and gloves for Maddie, sweaters for myself and Randy, gifts for friends. 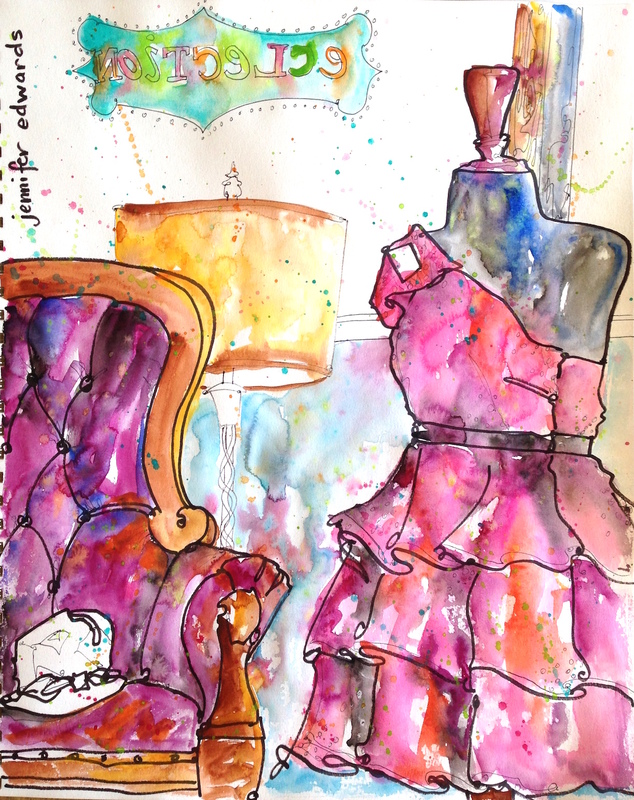 Seeing a life take shape in yarn and in a sketchbook, allowed me to see and love the little life I was living. I didn’t need a VW bug or a trip to France to make my life beautiful or worth living. That beauty was there all along. I just needed a lens through which to see it and celebrate it. Of course, I would still love to travel to France. Yes, it is still good for me to dream about that and make plans toward it. But to pine for what one does not have and can not have at the moment is a way of living I no longer want. I want to enjoy where I am right now, who I’m with, and what I’m doing at the moment. 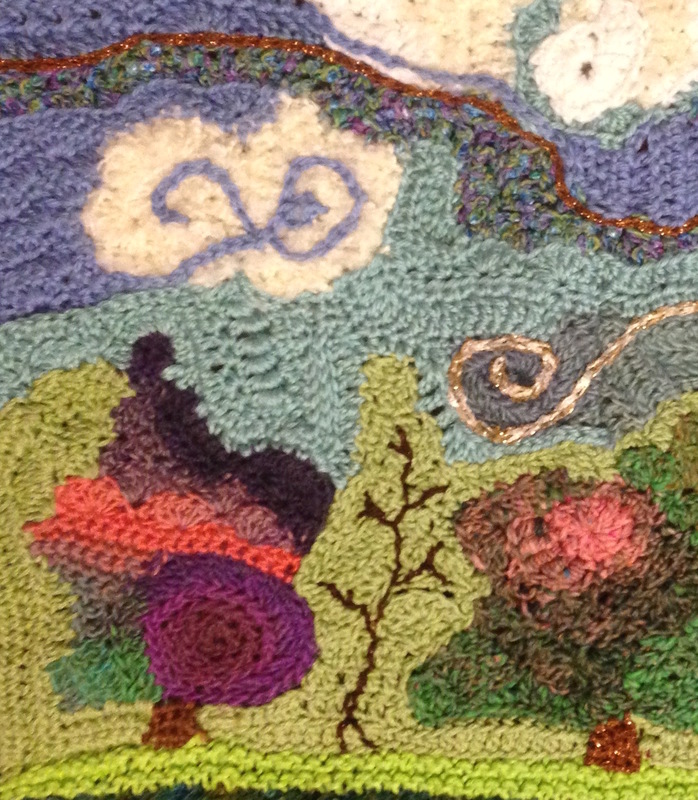 Drawing and knitting are two ways that allow and foster this love for the life I have. I will still dream. Dreams are delicious. But I want to spend my days living out the dreams that are happening right under my feet. I want to savor the life I have, drink it to the dregs, leaving few stones unturned. And if my feet get to step into a VW bug once again, or if they carry me to France, or out back to feed some chickens one day, fine! Wonderful! Magnifique! But if not, life will have been no less lovely, because I have learned to love what I live. **I’d love to hear what ways you have found to Love What You Live. I am so pleased to have my artwork represented by a sweet little gallery here in my town of Kernersville. It has been many years since I’ve participated in a gallery. Too long I think. But I was waiting for just the right time and more particularly…just the right gallery! Southwinds Art Gallery is the perfect spot to house my artwork, books, cards and prints of Genevieve. The night of the Art Show opening, several pieces of artwork sold along with many books, for which I am so grateful! Angie Jarman (the owner of Southwinds) and I talked about how we could open up the exposure of the remaining paintings to a wider audience. I asked if she would be willing to mail them to anyone who might like to purchase a painting, but who lives out of town. So here is a “gallery” of some of the paintings available through Southwinds. It doesn’t matter where you live, as long as you’re willing to pay the shipping, which of course is cheaper for those living in the United States. The price of each painting is such a deal! Angie has matted and backed each piece with Conservation mats. The only thing you’ll have to do when you receive the piece is to frame it under glass. Angie can even frame it for you, if you would like that option, as she is an expert framer as well as gallery owner. I’ll be posting other available paintings coming soon! Be on the lookout here, as something just might tickle your fancy, or be perfect to give as a gift! I am so very thankful for all who have supported my art over the years! Your continued support means so much to me! OR…leave a message in the comments section here on my blog and I will connect you with the gallery owner, Angie Jarman. If you’ve never been to Eclection, you need to go! If you’ve been, then you need to come visit again this Saturday!! Not only will you be able to finish off those last minute gifts, but you’ll also be able to listen while I read Genevieve and the Kite! So bring your child/ren or any stray kids who are bouncing-off-the-walls-cuz-they-can’t-wait-for-Christmas!! They (and you!) will be able to make a gingerbread house for a small fee, and a Kite bookmark for free! Plus…you’ll be able to see first-hand the amazing wall Chris (the owner) created! 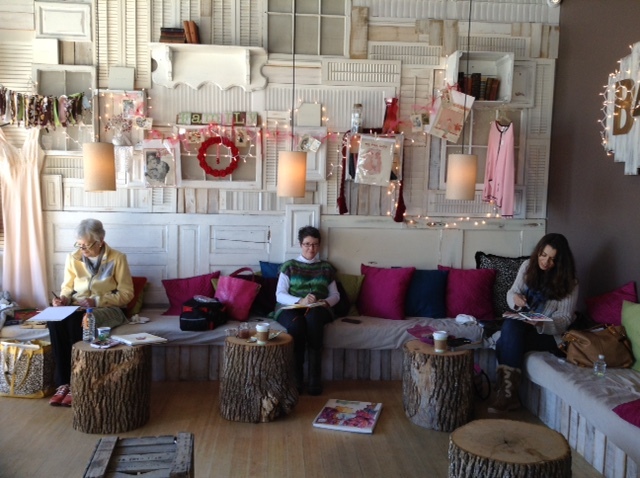 And you’ll see where I sit to draw on Fridays with my friend Debbie. We’ve been choosing different views from the Breathe Wine Bar & Lounge area right in the front of the shop where that amazing wall is. Oooh, maybe I’ll even bring my sketchbook and draw a bit! Bring your sketchbook too!